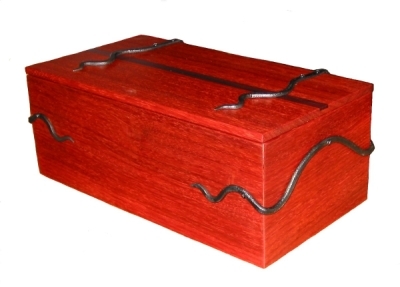 This box was made to house the ashes of a beloved companion. Deep clear cherry wood with iron vines and leaves for an organic look. 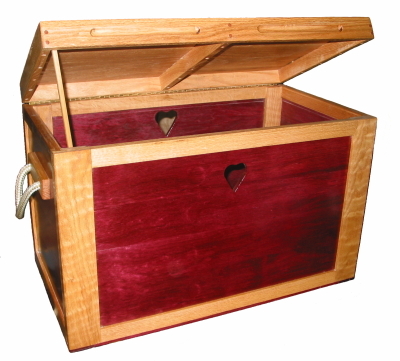 A sturdy childs toy chest of Purpleheart wood and solid oak. This chest is designed for a lifetime, heavily constructed of oak and purpleheart with heart-shaped accents and easy-open lid. Wrought iron with a hematite sphere. This wand was requested for its itense earth and fire symbolism. Heavy, balanced and grounding. 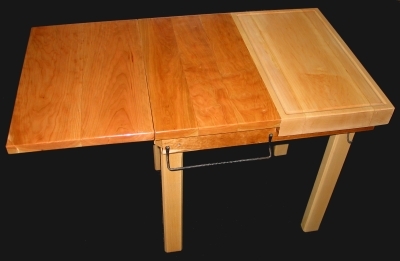 A sturdy table with an integrated 15 X 26 inch hard maple butcher block and rich figured cherry tabletop and drop leaf. Designed to provide workspace and a robust cutting surface for a busy kitchen, it features heavy construction, beautiful wood, and hand forged stainless steel ironwork. Forged accessories include a towel ring, an underside pot hanger, utility hooks and multipurpose rack. Made of vivid red Padouk wood with a purple Mexican Kingwood stripe. 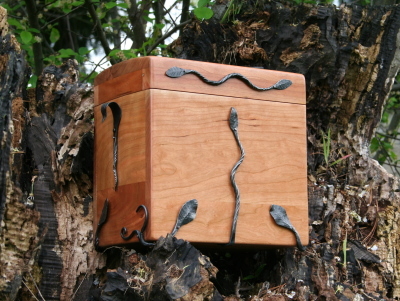 Iron snakework bands the sides and top, incorporating hinges for the lid. Spanning a 20 foot bay window, hand forged brackets and finnials. Unique brackets support this 3/4 inch steel curtainrod over 20 feet of bay window. The black steel brackets feature graceful curves and an almost organic elegance. 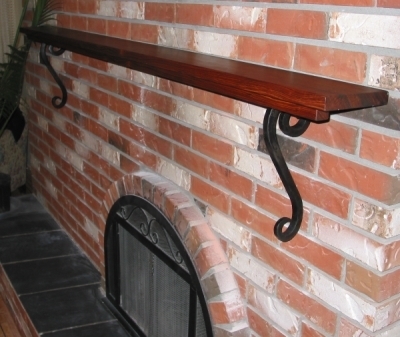 7 feet of beautiful Cocobolo rosewood, supported by curled iron brackets. The heavy iron brackets echo the curled design of the fireplace screen and stairway railings in the house. The rich red rosewood is finished with a hand rubbed satin oil finish. Two beautiful tables in solid natural cherry. 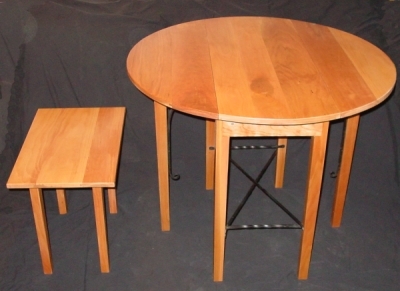 A gate-leg drop-leaf table and a matching small end table both posess elegant, classic lines and beautiful figured cherry. Forged ironwork accent and strengthen the larger drop-leaf table. 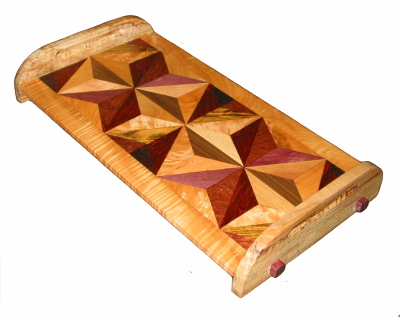 A sampling of ornamental and functional woodwork including this cutting board of cherry and maple.